Sheeran's second studio album, x (read as "multiply"), was released worldwide on 23 June 2014. In a span of three years, Sheeran wrote more than 120 songs for the album, the earliest of which was composed shortly after + was released. The album features tracks produced by Rick Rubin, Pharrell Williams and Benny Blanco, as well as that of Gosling's. x peaked at number one in both the UK Albums Chart and the US Billboard 200. 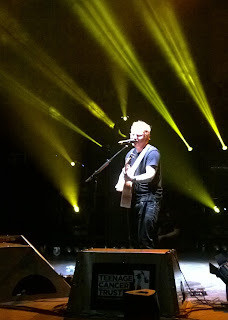 To support the album, Sheeran embarked on a world tour starting on 6 August 2014 at Osaka, Japan. 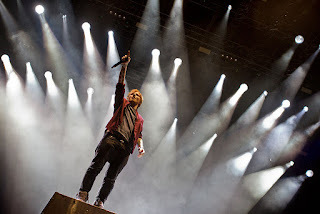 On 27 September 2014, Sheeran was one of the headline acts at the Melbourne Cricket Ground prior to the 2014 AFL Grand Final. Following "Don't", "Thinking Out Loud" was released on 24 September 2014 as the album's third single. Unlike his previous music videos, Sheeran took the lead role in the single's accompaniment, where he performed a ballroom dance. It became his second single to reach number one in the UK, and spent eight weeks at number two on the US Billboard Hot 100 (with only "Uptown Funk" by Mark Ronson featuring Bruno Mars keeping it from top spot). In 2014, combined streams on Sheeran's catalogue in Spotify reached 860 million; Spotify named him the most-streamed artist and x the most-streamed album. In the same year, the album also earned Sheeran the distinction of being iTunes' biggest-selling artist in the UK, Ireland and New Zealand. x was nominated for Album of the Year at the 57th Grammy Awards. On 25 February, Sheeran won British Male Solo Artist and British Album of the Year for x at the 2015 Brit Awards. On 21 May 2015, at the Ivor Novello Awards, Sheeran received the award for Songwriter of the Year. On 21 June, Sheeran co-hosted the 2015 Much Music Video Awards in Toronto, where he performed the singles, "Thinking Out Loud" and "Photograph"; he also won two awards, Best International Artist and Most Buzzworthy International Artist or Group. On 27 June, Sheeran performed as the opening act for The Rolling Stones in their Zip Code Tour date in Kansas City's Arrowhead Stadium. On 10–12 July 2015, Sheeran performed sold-out shows at London's Wembley Stadium. The shows, which were announced in November 2014, were part of his world tour. The concert was documented and aired on 16 August 2015 on NBC; the one-hour special Ed Sheeran – Live at Wembley Stadium also included behind-the-scenes footage. In September 2015, Sheeran wrote "Love Yourself" for Justin Bieber's fourth album. Sheeran had initially planned to put the song on his third album ÷ and added that the track would have been scrapped before Bieber took the song. On 26 September, Sheeran performed at the 2015 Global Citizen Festival in Central Park's Great Lawn in New York, an event organised by Coldplay lead singer, Chris Martin, that advocates an end to extreme global poverty. Sheeran headlined the festival along with Beyoncé, Coldplay, and Pearl Jam. The festival was broadcast on NBC in the US on 27 September and the BBC in the UK on 28 September. Sheeran co-hosted the 2015 MTV Europe Music Awards on 25 October in Milan, Italy. He won the awards for Best Live Act and Best Live Stage; the latter was in recognition for his performance at the 2014 V Festival in England. Sheeran won the Breakthrough award at the 2015 Billboard Touring Awards. His single from x, "Thinking Out Loud", earned him two Grammy Awards at the 2016 ceremony: Song of the Year and Best Pop Solo Performance. In May 2016, x was named the second best selling album worldwide in 2015, behind 25 by Adele.